Millions across the world joined the quest for justice and recognition of the Armenian Genocide on April 24th. 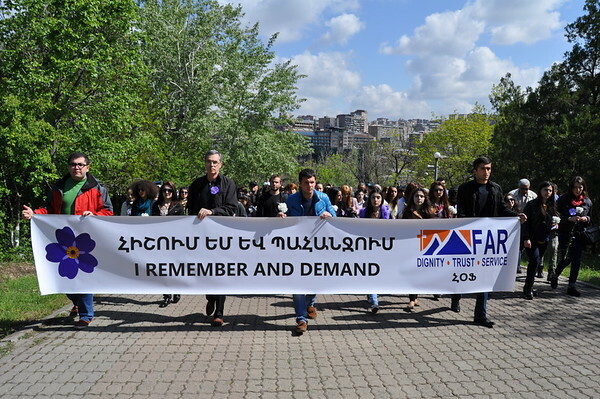 FAR’s scholarship students were no exception as they marched from Yerevan’s Sports and Entertainment Complex to the Genocide Memorial or Tsitsernakaberd to lay flowers around the eternal flame in memory of 1.5 million victims. More than 70 students supported by FAR’s Mathevosian, Gulamerian, Nishanian, Ajemian, Zambak, Berberian and Baghsarian scholarship programs, among others, joined the effort, which was led by FAR’s Education and Scientific Programs Coordinator Eduard Karapetyan. Many students openly expressed their passion for joining this effort. “Genocide is a crime that has no potential for forgiveness and no date of expiration. Even after one hundred years justice should be restored and the criminals need to be punished,” Berberian Scholarship recipient Lusine Mkrtchyan said during the march. “Today we honor the memory of these innocent victims and pay our respects, however it is not the end of our struggle but the beginning of one with renewed strength and greater consistency,” said Mathevosian Scholar Saribek Karapetyan. “Today we are here to not only pay tribute but to transmit our struggle to future generations so that they, too, remember and demand,” said Lusine Armenakyan, a recipient of the Gulamerian Scholarship Program.